His first advice to me, and one that he repeated many times over the years, was “watch the ball until it comes off your racquet. Don’t worry about where you are going to hit it.” This advice from Kenny Beer never became automatic in my game, but when followed, it gave me a few points. 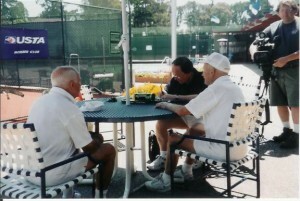 When Cari and I joined the Peninsula Tennis Club in 1994, Kenny was one of the first I played with. Other acquaintances told me he was famous, but I didn’t know much about him, so I suggested a singles match. I won the first two games, and feeling that I was taking advantage of our age difference, my seventy five and his ninety, I told him I would take it easy on him. “Don’t you dare,” he replied. We finished that set and the next set without my winning another game. From then on, my play with him was always doubles. For the next several years I played lots of doubles, not necessarily with Ken, but he was usually out there. One member, Larry Cook, began setting up matches every Friday with Kenny, and selected the players, but after about four years Larry retired to an assisted living home, so I took over setting up the play for the next few years. Kenny lived alone in his home in Hillsborough, and pretty well took care of himself. However, his two daughters, Fran Kristofferson, of Palo Alto, and Dottie Lodato of Menlo Park (or Atherton) arranged for dinner to be sent to him each evening. His wife, Mavia, who was ailing about the time I met Kenny, had died a short time earlier. 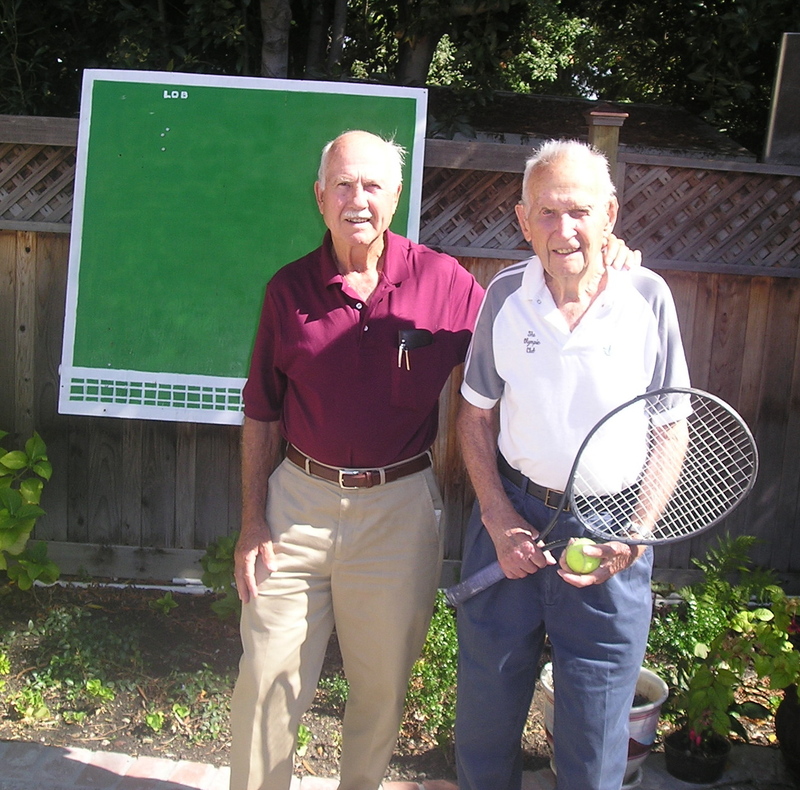 He had been very attentive to her care, but now his daughters, son John, and his tennis friends put him into good spirits and increased his playing time. So, who was Kenny Beer? Born December 9, 1903 in Utah, he received a degree in mathematics from Stanford University. He joined the Army Air Corps and eventually joined Pan American Airways as a pilot, flying the Clipper sea-planes, and later doing training and assignment of pilots. He taught himself to play tennis during lay-overs, but it was after his retirement at age sixty that he took it up seriously. During the next thirty eight years Kenny won some seventy two national amateur titles in his age group, the last one at the age of ninety-eight in Boston. Shortly after I took over arranging the matches, Kenny had his driver’s license revoked. He would never stop complaining about that “woman cop” who saw him make an illegal turn where there was no traffic. From then on, I would pick him up at his house and drive him down to the club. Usually I could come in an unlocked back door, search him out in the house, perhaps the shower, sit with him in the kitchen while he ate breakfast, usually soft boiled eggs, watch him meticulously rinse his dishes in the sink, find his tennis racquet and one can of balls, and off we went. He preferred to leave the house through the attached garage door. He would raise it, then press the down button, and we would dash under the descending door, bending double to assure we would clear. It made me nervous, but more so to watch him, though he always made it. There were reminder notes all over the kitchen, written by his daughters, which he frequently forgot to read or follow, but he got along amazingly well. There were problems sometimes. If the back door was locked, I would go around the house knocking on windows and doors, shouting his name. A couple of times I could not locate him, so on return to the club I would phone Fran, and she would apologize for not having told me he was visiting her. Another time, after spending an hour searching for his hearing aids, we gave up, and solved the problem by shouting in his ear during the game. My next door neighbor, Carol Archer, told me her son, Chris, who worked for KRON San Francisco’s channel 4, was always looking for new and different types of specials. 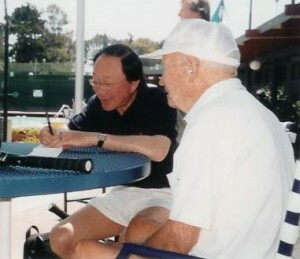 I suggested Kenny Beer, and we arranged for reporter Vic Lee and his photographer to visit us at the Peninsula Tennis Club. Fran and Dennis Huajardo accompanied us on the court, and Kenny put on a good show for the news that evening. My time with him alone was a pleasure. We talked about more than tennis. He loved to tell of his flying experiences, of flying the mail, of sunning on the beach with Lindberg during a layover in Honolulu, of rebuilding his fireplace to make it more efficient for his evening fires, the wood for which he split himself. His stories sometimes changed in the re-telling, but that’s O.K. We old people have that right. One day, when picking him up, I saw this massive pile of dry eucalyptus logs on his drive. I asked how he was ever going to split it, knowing that dry eucalyptus was extremely tough. He told me not to worry. The next week the pile was still there, so I challenged him again. He went to his shop and brought out a chain saw, set a log on end and proceeded to saw down with the grain. Now!, I bleed, just looking at a chain saw, and I implored him to refrain. The next Friday I phoned him to verify our game. He said “not today.” His son was there with a log splitter and they would clean up the pile. One Friday we were walking onto a court when he tripped over an uneven piece of sidewalk. He fell face forward, his right hand trapped under his racquet handle, and his face hit the racquet frame. All the courts emptied as the players rallied to his assistance, women consoling him and staunching and dabbing away the blood. Someone brought an office chair with casters and we rolled him to my car, where, with the top down so he could get in easier, I drove him to Peninsula Hospital. I turned him over to an orderly (you don’t hear that word anymore) while I parked the car. Inside, it was wait until we had a chance to talk to admissions, then another wait for triage. Finally, when admitted, the nurse asked his age. When he replied, “Well, they tell me I’m ninety nine,” the nurse then spouted “My, you sure don’t look it.” Then she asked how he injured himself. He said, “Well, I was playing tennis.” Without letting him finish, she said, “What! 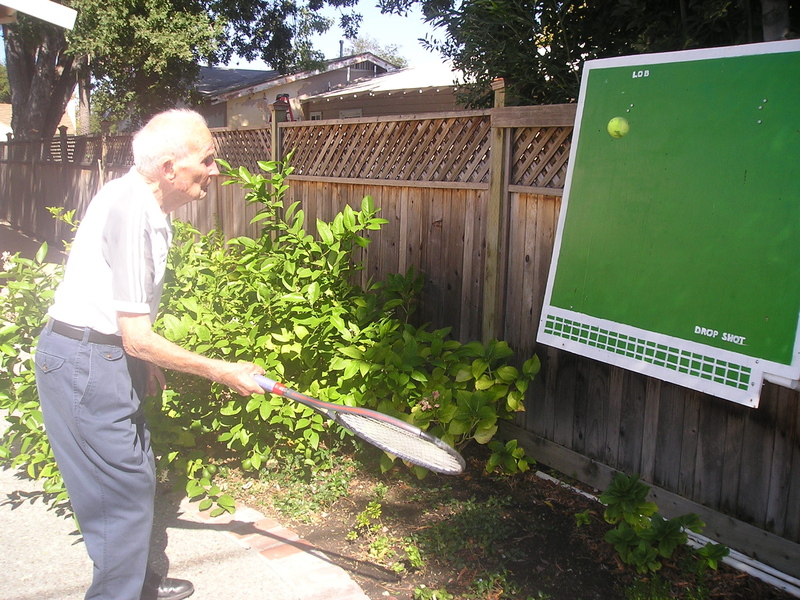 You were playing tennis at ninety nine,” and called nurses and doctors in to see this exceptional man. One more question; “What medicine do you take?” “I don’t take any,” he replied. She repeated the question and he repeated his answer. Rather exasperated, she asked firmly “Don’t you take any medicine?” Calmly he answered “Oh, I take a vitamin pill.” He eventually went in for treatment and I stayed until a friend of Dottie’s arrived to relieve me. Come December 9, 2003 Kenny turned one-hundred and he was given a great party at the club, with his children, grandchildren, other famous tennis players, and many of his friends from Pan American days. My contribution was singing a song about Ken that I had composed, with my wife, Cari, at the piano. After his injury, the daughters sent Kenny to an assisted living home in Redwood City. He had told me of his daily practice of hitting the ball against a backboard. I visited his Hillsborough home and discovered a 4 X 4 piece of plywood fastened to his shop. I made him a new one, painted it, and his son fastened it to the fence at his new residence. And here is Kenny’s secret of success – practice, practice, practice. I wasn’t aware of what he could do on that backboard; a hundred, two hundred, and more, hits on the board without the ball touching the ground. He had perfect control of his shots. At this time we also learned that Kenny would sit in the President’s box and be honored on the court at the U.S. Open in New York that September, 2004. So, again I got KRON to video Kenny using the backboard and talking about his son, John, taking him to New York. Another news feast for viewers. We played a few more games in Burlingame, but in late November of ’04 I hit a short one to him across the net. He went for it, but stumbled and fell on his face. An ambulance took him to Stanford Hospital. I followed and Fran advised me that he was pretty banged up, but would recover. Recover, he didn’t, for he developed pneumonia. Ken left the court on December 4, 2004, one week short of his one hundred and one birthday. You’re a mel-o-dy -from a sym-pho-ny by Strauss. You’re the Tow’r of Pi-sa. You have flown the world, Just skimming above the ocean. And you really show it. Just across the net, it stops. This entry was posted on Friday, December 18th, 2009 at 5:58 pm	and is filed under Friends. You can follow any responses to this entry through the RSS 2.0 feed. You can leave a response, or trackback from your own site. Thanks for your comment. I like the story I wrote because I really liked Kenny Beer. I happened upon your story by pure chance. I too am an aficionado of Ken. I grew up a Pan Am brat and Ken and his family were an important part of my youth. Did you know that Ken was a great skier and even wrote a book on the Art of How to Fall. I skied with Ken and his family in Portillo, Chili in the sixties. I remember playing tennis with Ken when he was an old man of seventy and being told to just watch my alley and he would get to everything else; and he did. I too never won a match from ken nor did I ever NOT lose a race to the bottom of Squaw Peak. I had lost touch with Ken and thank you for informing me of the last year of his fabulous life. I just read your small note about Kenneth Beer. I knew Ken for about five short years, as I was interested in his flying for Pan Am airlines. I too am an airline pilot. Anyways, Ken was one of the nicest men I ever met. 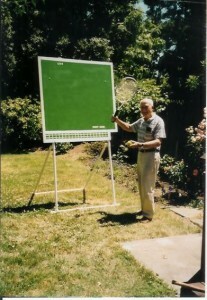 I played tennis with him a few times. What I couldn’t believe was the man I was playing was 99 years old and the history he has participated in. Every time I fly into the SF bay area, I tell the story of Pan Am and Ken Beer and the flying he did in the Pacific. My passengers love the stories and most never knew any of it. I was honored to know Ken, and I cherish the time we played tennis and talked aviation. I will also say I was honored to make a toast in his memory for his final gone west flight.